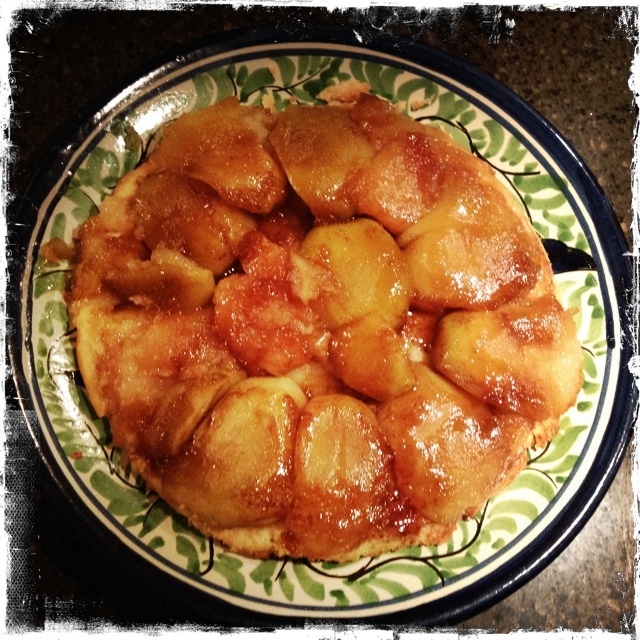 Tarte tatin is a traditional French dessert. It is like an upside-down apple pie with the apples coated in buttery caramel. It isn’t too difficult to make this dessert that will be a crowd-pleaser. I had never eaten a tart tatin before, but loving French food I took it upon myself to make one for a Thanksgiving dinner dessert last weekend. I found many recipes that used puff pastry, but I really wanted to make my own buttery pastry – and this one is awesome. The tartness of the granny smith apples works well to balance the sweetness of the caramel. I took a little bit of the caramel out of the pan before adding the apples because I was worried that it would be too sweet, but in the end we agreed that even though it was really delicious, it would have been also been good if I had left all of the caramel in. I found this recipe in the Cook’s Illustrated Cookbook – it is so easy to follow, and they even have diagrams to help you figure out how to lay out the apples. And best of all – this was delicious! I will absolutely be making it again one day. Soon, maybe. By the way, it does taste way better than it looks in this photo. I forgot my camera at home the day I made this, so I hope to make it again one day and take a more appetizing photo. Combine the flour, icing sugar and salt in a large bowl, or the bowl of a food processor. Add the butter and process, or use your fingertips to rub the butter into the flour mixture until it resembles coarse cornmeal. Add the egg and mix until it just comes together. Pull the dough into a ball, then place it on plastic wrap. Flatten it into a disk, then wrap tightly and refrigerate for 1 hour. Preheat the oven to 425 degrees. Melt the butter in a 12-inch nonstick or cast-iron pan over medium-high heat. With a wooden spoon stir in the sugar and cook until light golden, about 2-4 minutes. Take the pan off the heat, then add the apple quarters cut-side down, filling the skillet tightly. You may need to cut the apple pieces in half again to fill the centre. 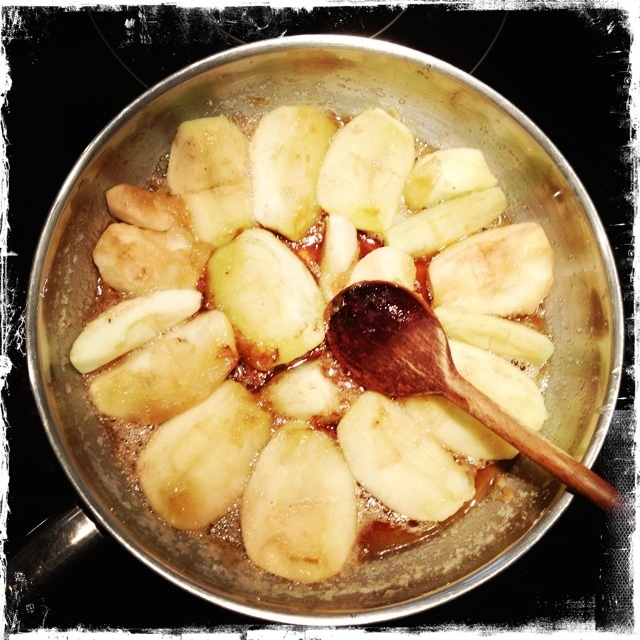 Cook the apples over medium heat for about 3 minutes, then flip them cut-side up and cook for another 3 minutes – the apples should be lightly golden, and the caramel should be darkly coloured. While this is cooking, lightly flour your countertop, then roll the dough into a 35cm/14 inch circle. Place the dough on a baking sheet and cover with plastic wrap and refrigerate if you will not be using it immediately. When the apples are ready slide the dough circle over the top. Work carefully, making sure you don’t burn your fingers on the pan or hot caramel. 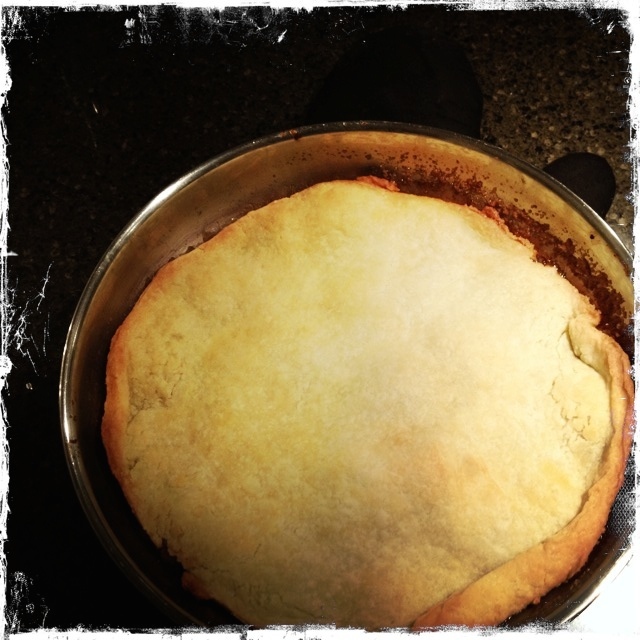 Fold the edge of the dough back so it fits snugly into the pan. Place the pan in the oven and bake for about 20 minutes; rotate the pan halfway through baking. Remove the hot pan from the oven and let it cool for about 30 minutes before attempting to release from the pan. Run a knife around the edge of the pan, then place an inverted serving plate over the top of the pan. Using oven mitts, carefully flip it to release the tarte onto the serving plate. Some apples may stay in the pan; you can just place these carefully on top to make it look intact. Serve with vanilla ice cream, creme fraiche, or whipping cream. Mmm, what would be in a savoury one? My favourite is a fresh tomatoe, basil and dibuffala mozzarella. With tons of garlic.